The bodies of two people have been found dead inside of a home in Lower Moreland at 12:50 p.m. this afternoon. Investigators are at the scene on the 1100 block of Country Lane (off of Paper Mill Road) in the quiet wooded neighborhood trying to determine what happened. The couple was found by their 14-year-old son who called police. Lower Moreland Police say that the bodies of the 48-year-old man and his 43-year-old wife were mutilated by a chainsaw. They believe that at least the death of the wife is a homicide. The couple has been identified by friends and neighbors as Chris and Nicole Peppelman who own a nearby Huntingdon Valley excavating company (James Peppelman Inc). Autopsies will be performed tomorrow. The couple has two other sons, 3rd and 6th graders, who were in school at the time. A vigil was held at Bryn Athyn Cathedral on Tuesday evening. UPDATE 4/1 4:30 pm: The Montgomery County Medical examiner has officially identified the deceased as 48-year-old Chris and 43-year-old Nicole Peppelman. It has been ruled a murder-suicide. Nicole's death was ruled a homicide. She had gaping sharp force injuries to her abdomen. Stab wounds and choking also contributed to her death. Chris' death was ruled a suicide. He also had gaping injuries to his abdomen and right thigh. The Peppelman's had filed for divorce in 2010 but it was not finalized until this January. The couple's three boys had been living with Nicole. They have been described as loving, involved parents. A woman has died and others are injured after a car slammed into the front of a nail salon in Northeast Philadelphia on Tuesday. 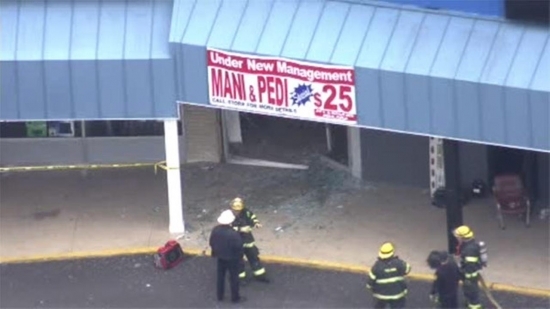 It happened at 11:50 a.m. at Cindy's Nail Salon in the 9800 block of Bustleton Avenue. The driver of the car hit the gas pedal instead of the brake and drove straight through the glass front of the salon. One female customer was struck and killed. Three other people were transported to the hospital. The 82-year-old driver was not injured. The incident is under investigation. The driver is not expected to be charged. The Pennsylvania Supreme Court ruled today that a county judge acted properly when he appointed a special prosecutor to investigate grand jury leaks tied to Attorney General Kathleen Kane. Kane challenged that appointment after the resultant grand jury recommended charges against her following its investigation. The Pennsylvania Supreme Court's main opinion said that the Montgomery County judge "acted within his authority and sound prerogative" when he appointed lawyer Thomas Carluccio to investigate the 2009 grand jury leaks linked to Kane. The grand jury's recommendations are now in the hands of Montgomery County District Attorney Risa Ferman who must decide whether or not to file charges against the state's attorney.